Three illustrations by Wilhelm Ostwald from his 1916 The Color Primer (Die Farbenfibel). “Continuity. Between two different grays it is always possible to insert a third gray, which is lighter than one and darker than the other. In this manner the steps can be made even smaller, until they finally become imperceptible. “It probably follows that the complete gray series consists of an infinite number of steps. However, if one places between two terminal points a series of gray sheets, each of which is just noticeably lighter than the previous one, it will be found that one cannot discern an infinite number of intermediate steps. Rather, a finite difference is necessary if one is to distinguish a series of grays, and if the steps become very small, differences can no longer be discerned. “The Threshold. This border between just noticeable difference in color is called the threshold” (p20-21). “Thus, there is between 13 and 14 a just noticeable difference, while between 15 and 16 there is an unnoticeable difference. Even though 16 is a trifle weaker than 15, they both appear equally as light” (p21). “Equality. Only the presence of the threshold makes it possible for us to regard two gray colors as equal. What we cannot distinguish we call equal [my emphasis]. Even if we could recognize every difference that actually existed (in gradations) it would be impossible to create two equal grays, as we could never remove the last traces of the actually existing differences. 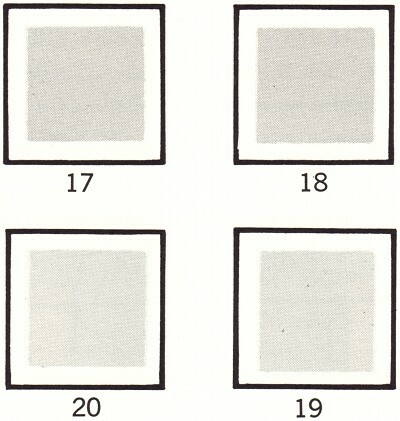 In effect, we will regard two gray colors such as 15 and 16 as equal, even though an objective difference between them has intentionally been created. “The presence of the threshold has certain consequences with regard to the apparent equality of colors. These consequences are different from the mathematical relationships that are usually established when no regard is paid to the threshold. For example, in general this law applies: if a = b and b = c, then a = c. And it also follows that from a = b, b = c, c = d, that a = d. Now, if gray b is indeed lighter than a, but by less than the threshold, and if the same applies between c and b, and between d and c, we would first state a = b, b = c, and c = d. But if the sum of these imperceptible differences exceeds the limits of the normal threshold, then we could by no means say that a = d, but we would experience d as lighter than a” (p21-22). “Thus, there exists a difference between steps 17 and 18 that is smaller than the threshold. Therefore, if steps 19 and 20 are covered, 17 and 18 will appear equal. Similarly, 18 and 19 appear equal if 17 and 20 are covered, and the same applies to 19 and 20. We have observed, therefore: 17 = 18, 18 = 19, and 19 = 20 and are thus inclined to conclude also that 20 = 17. However, if we cover 18 and 19 and compare 20 and 17, step 20 is unmistakably lighter than 17. “Incidentally, the threshold is not an invariable value, as it often has a different value with different persons. Much depends on visual ability; in some individuals the threshold may increase or shrink through exercise or through fatigue and other weakening influences. For this reason, some will not experience the difference between steps 13 and 14, while others will notice a difference between 15 and 16. The number of distinguishable steps of gray under normal conditions amounts to several hundred” (p23). Three illustrations of Mercurial birds, representing the volatile nature of alchemical work. 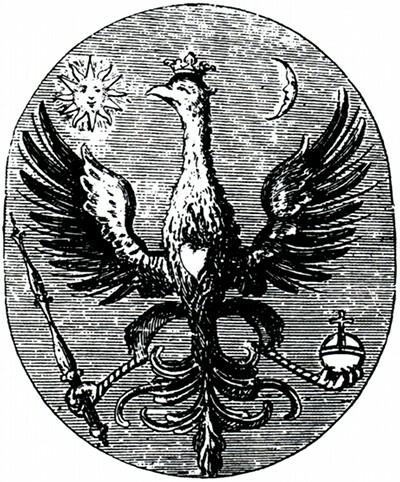 Emblem 9 (of 12) from the 1752 Hermaphrodite Child of the Sun and Moon by unknown alchemist L.C.S., reproduced by Adam McLean (p42). Translates Mike Brenner in McLean’s edition: “A soaring eagle with heart aflame, with the Sun and Moon at the threshold of its wings, bears tokens of dominion: the crown of influence, the sceptre of the king, and the globe of the empress. “Its buoyancy in flight and its flaming heart show the ethereal nature of this eagle: wet outside, fire inside. It is our Liquid Mercury. “The Sun and Moon seek solace under the shadow of these wings, basking in the pleasing radiation from the flaming heart. “To win the Crown of the Earth, fuse the power of the sceptre and the globe…” (p42). Copperplate 7 (of 19) from Johann Conrad Barchusen’s 1718 Elementa chemiae, appearing in Johannes Fabricius’s 1976 collection, Alchemy (p18). Comments Fabricius: In plate 7 “the deluge [cf. 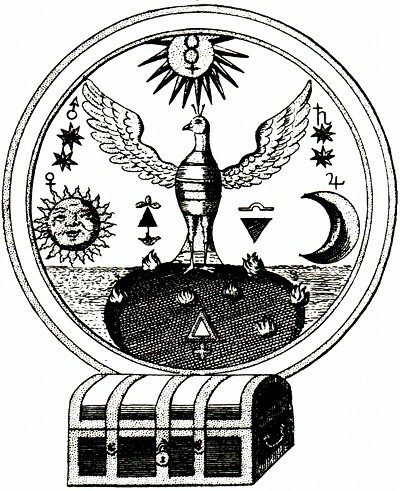 the biblical Flood] leaves only a small patch of land, on which the Hermes bird descends [beneath the symbol of Mercury]. The chaotic situation is emphasized by the emergence of the seven planets on the horizon, a symbol of universal disorder. As indicated by the sign of sulphur, the sinking island is set on fire by sulphurous flames from the hellish interior of the earth. Yet the alchemist’s sinking island is ‘supported’ by a sealed chest of drawers emerging from the sea and containing immense riches of silver and gold. Although the adept’s world has become a sinking island, it has been simultaneously transformed into a treasure island” (p18). Second woodcut of the 1550 Rosarium philosophorum, also appearing in Fabricius’s Alchemy (p24). In this depiction “the king, standing atop the sun and representing the spiritus, meets the bride of his choice, resting on the moon and representing the anima. 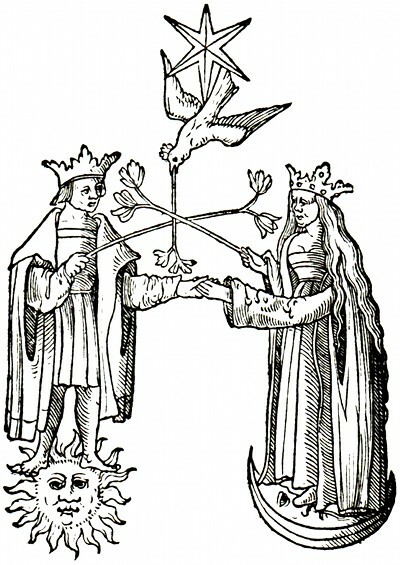 The rose branches crossed by king and queen bear out their mutual love, but the court clothes suggest the restrained nature of their initial encounter. “The two roses at the end of each branch refer to the four elements, two of which are active and masculine (fire and air), while two are passive and feminine (water and earth). Their ordered arrangement in a ‘rosie cross’ suggests the abatement of the prima materia and its warring elements. The fifth flower is brought by the dove of the Holy Ghost, a parallel of Noah’s dove carrying the olive branch of reconciliation in its beak. Descending from the quintessential star, the bird reconciles the masculine and feminine elements, just as its third branch equates the rose branches with the three pipes of the mercurial fountain, now transformed into a stem of roses. “The dove is the agent effecting the rapprochement between king and queen, just as the bird indicates the spiritual and heavenly nature of their love. The unusual character of this affair is further stressed by the partners’ left-handed contact. This uncustomary gesture points to the closely guarded secret of their infringement of a general taboo. Actually, the royal couple engages in ‘unnatural’ and illegitimate love, the secret of which is of an incestuous nature: the bride is the king’s own sister. Hence the ‘Rosarium’ admonishes: ‘Mark well, in the art of our magisterium nothing is concealed by the philosophers except the secret of the art…'” (p24). 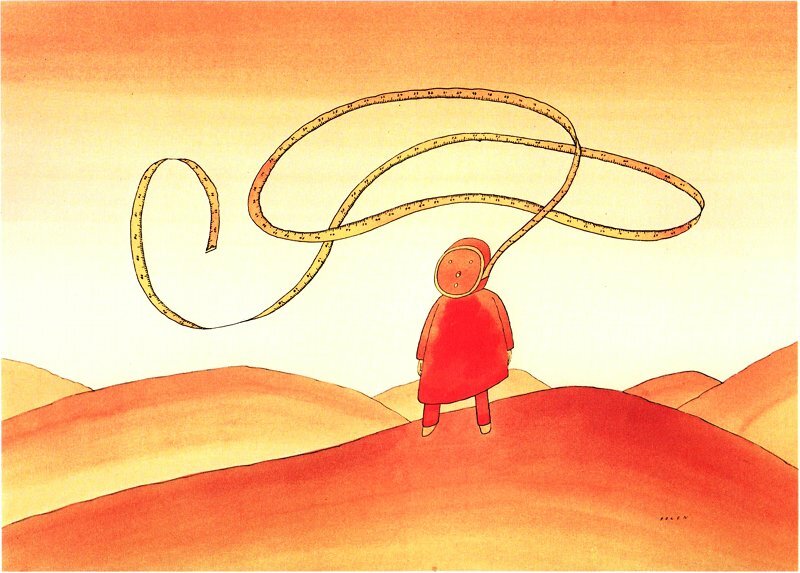 A painting by Jean-Michel Folon accompanying Giorgio Soavi’s 1975 essay, Vue Imprenable. Thought process, 1969. Click for larger version. Writes Soavi, on his visit to Folon’s country house outside Paris: “A view is unseizable when one can never see it all at once. One only has to weigh the words carefully: ‘vue imprenable.’ What horizons! Poetic; that is, invented. Measureless, therefore without men; exalting, therefore unreal or, at most, painted in a fantastic manner.